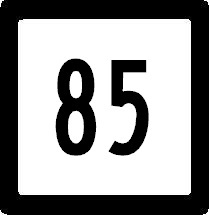 Connecticut State Route 85 is a north-south highway in East-Central Connecticut. It runs about 38 miles in length. This highway goes from U.S. Rt. 1, at New London, to U.S. Rt. 6/44 at Bolton. Info on CT St Rt 85 is broken down by county below.